Review posted August 3, 2018. This story of the youngest child left behind is crafted well. So often when a younger child or pet saves the day, it feels contrived. In this one, the adventure is realistic and satisfying. The reader sees there can be compensations to being the smallest. but he was too little. Tiny, the oldest, had been to sailing camp five summers in a row. He gave Little Pig his book of sailors’ knots and a piece of rope. The speech bubbles on the pages inform us that Little Pig will be old enough to go next summer. Little Pig spends his first day, with a lot of spare time, learning to tie knots. Then Little Pig’s grandfather shows him the beautiful wooden ship he’s making for Little Pig. He promises that the next day, they’ll finish it together. They end up sailing the ship on the stream every day for the rest of the week. But on the last day, the ship gets away from them and goes down a waterfall, and is headed rapidly downstream. 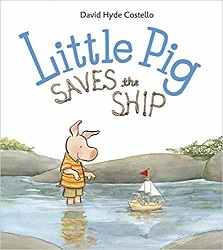 Little Pig runs downstream to a bridge across the stream – but his arm is too short to catch the boat. Then he remembered Tiny’s rope in his pocket! And that is how Little Pig saved the ship. I like the way Little Pig and Poppy tell all his siblings about his rescue. He still wishes he could go sailing with them – and the next day, they all sail his little boat together.